Reacts angrily to Pontus Jansson's celebratory peck. Leeds United’s Ezgjan Alioski hit team-mate Pontus Jansson for kissing him at full-time of Saturday’s 1-0 win over Sheffield Wednesday. 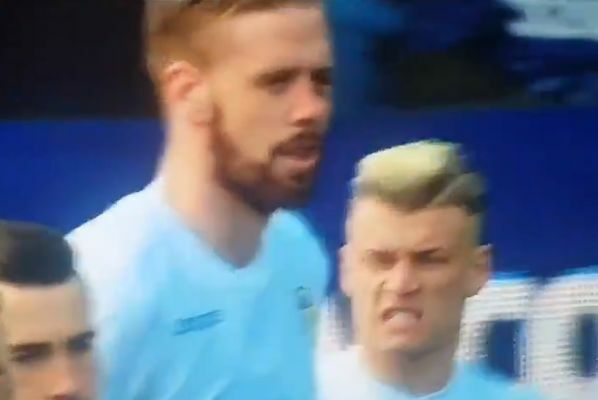 After the final whistle had blown on the Championship clash at Elland Road, Swedish defender Jansson planted a celebratory peck on the Macedonian. The gesture appeared to infuriate Alioski, who swung a punch at Jansson’s neck as he walked away, his face contorted with anger. It was not the first time this week that Alioski, a winger filling in at left-back in the absence of Barry Douglas, was caught on camera acting strangely. Before Tuesday’s 2-0 win at Preston North End, Leeds posted footage of him shaking the players’ tunnel on their way out before kick-off. In December, he nibbled Pablo Hernández’s during a 3-2 victory at Aston Villa. Marcelo Bielsa’s side lie 2nd in the table following their latest win, secured by Jack Harrison’s 65th minute winner.